Used symbol and timeframe: EURJPY H1. The Expert Advisor follows the trend. Be sure to optimize the broker's timezone parameter - BrokerTimeZone. BrokerTimeZone - broker's time zone. 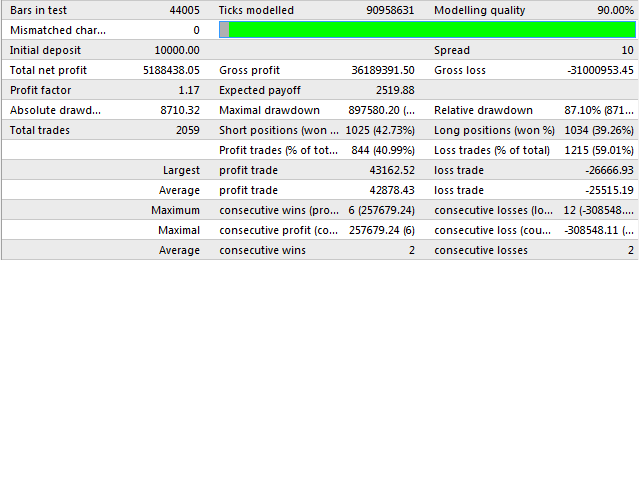 fixedTP - fixed take profit (specifying like in prices with 4 decimal places). fisedSL - fixed stop loss (specifying like in prices with 4 decimal places). maxOrder - maximum number of orders. risk - risk for the deposit per deal, activated when fixedLot =0. StopLossB - disable stop loss. Now the time zone in the strategy tester is adjusted automatically.